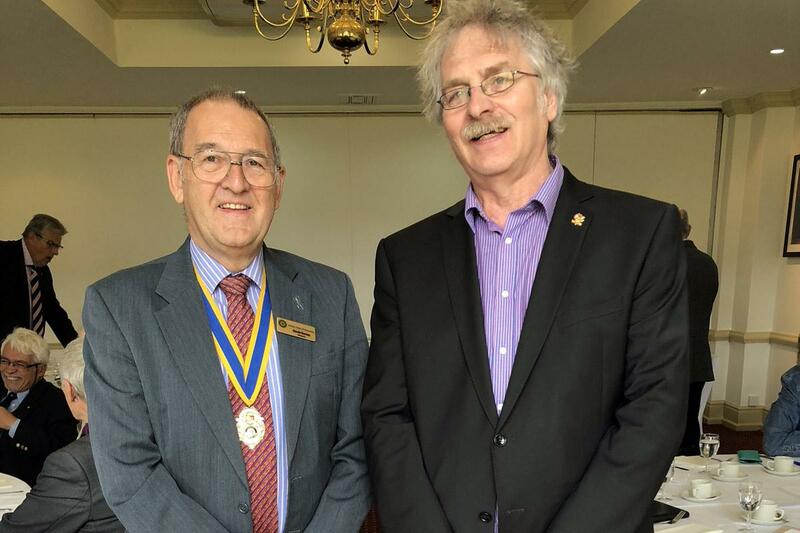 It was surprising how quickly time passed when Mark Hignett, volunteer and founder at Oswestry Town Museum, spoke to members of Oswestry Rotary Club about the short 7-year history of this small local institution recently. Without notes but with the aid of a small box of props, Mark engaged his audience with the story of how the museum had been founded with the support of the Town Council who provide its home on the top floor of Oswestry's Guildhall. A show of hands showed that not many Rotarians in the room had yet ventured up there before Mark proceeded to tell them what they were missing. With donations of the most unlikely items illustrating the connections that Oswestry people felt with the history of their town, items had been received from builders' skips, relatives' estates and most spectacularly eBay. Following his nose on the online auction site, Mark started a collection of letters written by Gilbert Bradley, a soldier at Park Hall Camp, together with the replies that he had received. Further purchases revealed the forbidden love story of Gilbert and Gordon which has gone on to take a life of its own. Mark has committed to write a book about the letters; the story has even attracted the interest of Hollywood producers intent on telling the story of two men who wrote: "Wouldn't it be wonderful if all our letters could be published in the future in a more enlightened time. Then all the world could see how in love we are." Mark advised to watch this space! With time moving on, the audience were invited to take part in the museum's latest project; this year's Heritage Open Days will extend to span across an 11-day festival in September with the theme of 'Women in Power'. Not content with the national target of 5 or 6 women that had made a difference to the area, Mark is on the look out for 101 women influential to Oswestry and has called it The Dalmatian project. "The theme is all about promoting women," said Mark. "Oswestry has always been guided by women, and it's time we started celebrating them. It is reputed that Guinevere, the wife of King Arthur, was born in Oswestry. To honour that, on the first weekend we will have a piece of granite with a sword stuck in it, whoever is strong enough to pull the sword from the stone will be named King or Queen of Oswestry for the week." continued Mark. "We are still looking for about ten nominations so if anyone can suggest a woman to be included we would be delighted to hear from them either by telephone or email. There is still time if you're quick!" The Dalmatian Project allows people to nominate women, past or present, who have made a difference to Oswestry. They don't have to live or have been born in the town, just someone who has been influential. The 101 women will promoted on boards at different venues around Oswestry throughout the festival. All too quickly, Mark's talk was over and everyone present was enthused with a pride in Oswestry's civic history and resolved that a visit to the museum should be made as soon as possible! * is accessible via a lift and careful spacing of the exhibits.